As you might notice, I have skipped the "vintage" in the title of this blog. In the beginning I planned to write more about my love for vintage fashion, but now I have realized this blog is about so many other things I love too. So to not mislead anyone, the name of this blog is now, simply, Miss Meadows' Pearls! But now to today's Fabergé object! 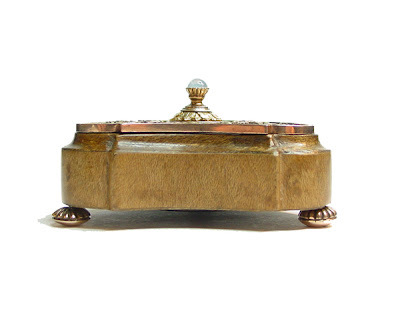 Not only jewelry and objets d'art came out of Fabergé's workshops. He also designed utilitary objects. Like for example the little bellpush I will show you today. It was made by workmaster Johan Victor Aarne, sometime around 1890! The triangular bellpush is made of wood, enameled with highly translucent pale pink over a guilloché ground that looks like sunbursts. The edge is of gold, and so are the decorative laurel wreaths. In the center sits the pushbutton, which is made of a circle of chased gold leaves, holding a moonstone. 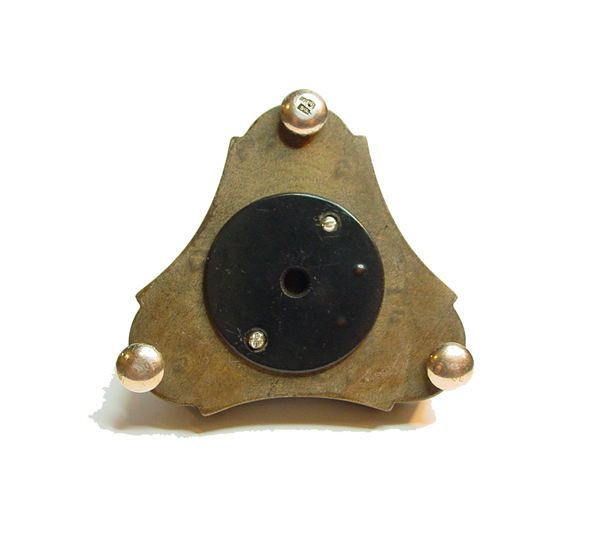 The bellpush is 2.24'' (5.7 cm) across, and is standing on three gadrooned bun feet. Underneath it still has it's original bakelite under panel. Wouldn't this be perfect to use when you need the butler to bring champagne?!!! 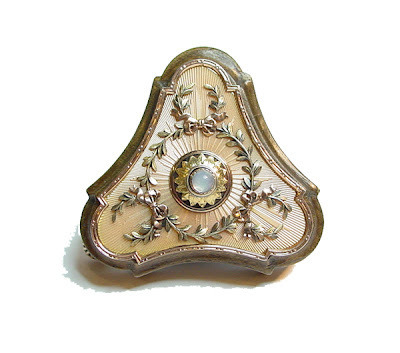 This is just gorgeous Miss Meadows, adore these recent non-egg Faberge items!